Surrounded by seven acres of lawns, meadows and woodland on the shore of one of Ireland’s most beautiful lakes, the setting is idyllic. For the active, boating and fishing are available on the premises, and there are golf courses and riding stables within easy distance. Others may prefer simply to sit and contemplate the Gothic geometry of the roof timbers. Boats, fishing rods and bicycles may be hired. Restaurants and shops are a ten minute drive. Built by the Norman DeBurgos in the late 13th century it was a strategic fortress, along with Annaghkeen Castle in defending the Manor of Headford from incursions across Lough Corrib ( or Lough Orbsen as it was then known ) by the dispossessed O’Flaherty clan . 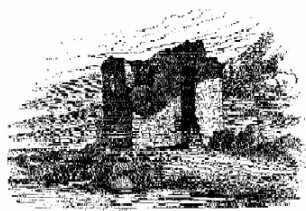 DeBurgo installed another Norman family, the Gaynards, as tenants of the castle and woods in Cargin and Clydagh .It is known that a William Gaynard was in possession there in 1574. Just 80 years later in the 1650s, the lands and castle were commandeered and given to the Staunton family for services rendered to the British parliament( the English Stauntons had supported Cromwell in the English Civil War ). The present structure was restored from a dilapidated ruin in the early 1970s and was a resurrection of sorts for an ancient stronghold . This seven hundred year old castle has lost none of its antique charm and simple grandeur in the course of conversion into a comfortable holiday home.